In the world of retail, today is Black Friday. My husband, who is a manager for Home Depot, went to work at 3 a.m. My son, who works for Gucci, headed to work at midnight last night. Me, not in retail, I snuggled in my bed until eight this morning. I felt absolutely gluttonous. I'm not a Black Friday girl. Shopping is burdensome enough to me, let alone shopping with everyone else on the planet. I did some baking today and pulled out some Christmas crafts. I worked on THE BOOK, and I made this. It's a fire-proof advent wreath. Advent starts Sunday and marks the four Sundays approaching Christmas. It's a time of preparation. Not for Santa, but for the Christ child. Every Sunday, a candle is lit. The candle can burn throughout a meal, or during a time of devotional prayer; then, it's distinguished. On the second Sunday, the first candle is re-lit, and a second candle is lit. This little ceremony is repeated every week, eventually lighting all four candles. 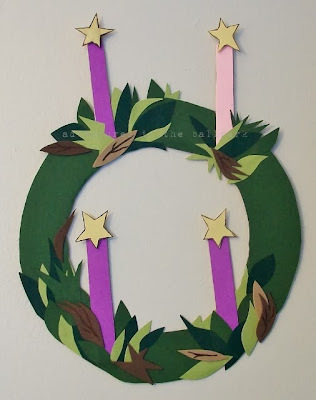 We always had an advent wreath when I was growing up. Now that my parents are in assisted living, they can no longer have a wreath because they can't have fire in their suite. This makes sense, of course, but they miss this tradition. So, I made a cardboard/construction paper wreath they can hang on their door. It has Velcro "fire" stars they can apply to the appropriate candle/s when needed. It warmed my heart to be able to create something that enables them to still celebrate advent in a tangible and familiar way. As I cut and pasted green leaves, I enjoyed the peace of my own home. I was grateful we'd had a nice Thanksgiving, and I was looking forward to Christmas. I was happy I was not circling the mall parking lot looking for a parking space, or standing in a winding line waiting to check out. When the wreath was done, I savored a cup of green tea and ate some homemade biscotti. Then, I took a nap. So far, it's been a lovely day. What color is your 'black' Friday?